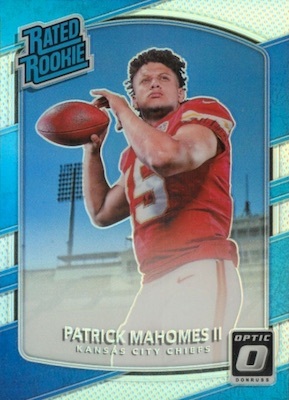 With every touchdown pass for the Kansas City Chiefs, Patrick Mahomes rookie cards push even higher. The young stud has quickly put his name among the best young quarterbacks in the league and his earliest cards are on the move. Giving Chiefs fans extreme optimism for the future, his ascension has been nothing short of remarkable and has many believing (and/or hoping) he is the second coming of Joe Montana. 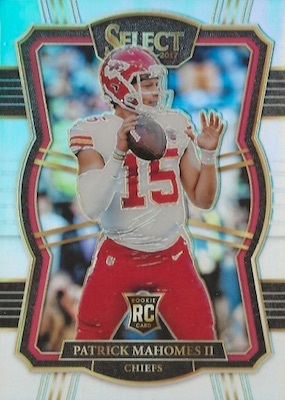 For collectors, it is already well beyond the point of getting in on the ground floor, as Patrick Mahomes rookies card values have surged. See the Patrick Mahomes cards with the most bids on eBay. 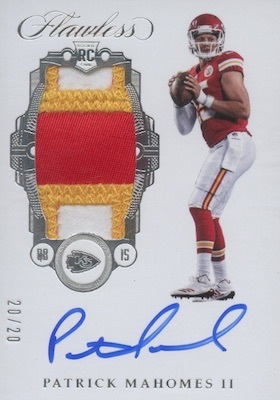 While demand is high, Panini at the helm of the NFL exclusive means the supply is there to meet it. 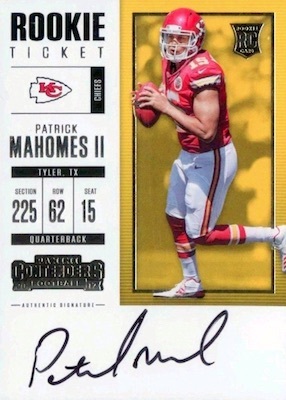 Nearly every one of the 40 licensed 2017 football sets has a Patrick Mahomes rookie card, and most offer an autograph, as well. 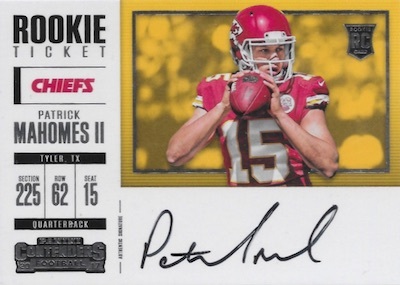 We have focused on some of the very best Patrick Mahomes rookies cards, including his top base rookie cards and key rookie autographs. 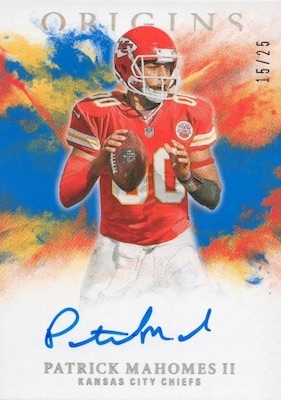 To get a snapshot of the most popular Patrick Mahomes cards at any given moment, view our real-time hot list. Bolded sets go directly to detailed product profiles and checklists. For many, Mahomes' NFL rookie autographs are already out of reach. But his base rookie cards are plentiful and relatively affordable. Most have low-numbered parallels, allowing collectors to upgrade when their budget permits it. 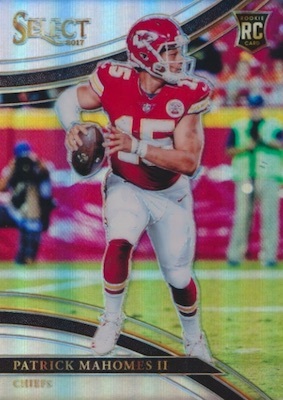 Putting some shine on the 2017 Donruss design, the chromium 2017 Donruss Optic features Mahomes in the Rated Rookie subset. If you need more of a challenge, check out the many colorful parallels. 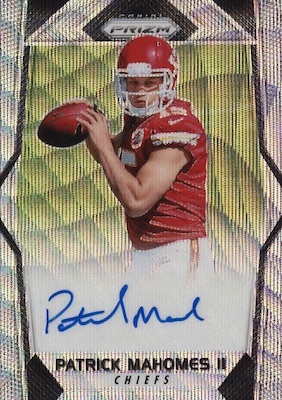 Working in a similar fashion, the Patrick Mahomes rookie card in 2017 Prizm offers a substantial rainbow for the QB. This choice is better for those who prefer more realistic action images versus the posed shots from the Rookie Premiere in the Rated Rookie card above. 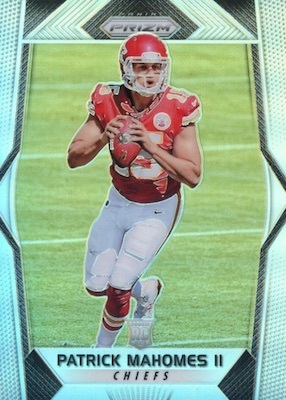 Supplying intricate designs, various parallels and two different images, 2017 Select includes Premier Level card for Mahomes (white jersey) with mostly die-cut parallels. His Field Level subset card (red jersey) is the rarer of the two. As stated, there are a ton of Patrick Mahomes rookie autographs. But since Panini short-printed most of them in comparison to the other first-year players, they can be quite rare on an individual basis. 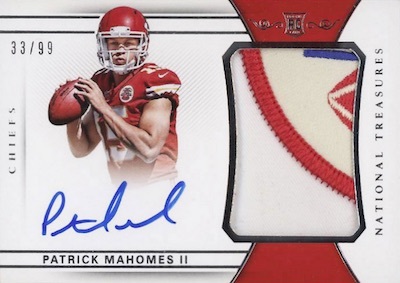 To be honest, you really can't go wrong with any of Mahomes' rookie card autographs. Nevertheless, several stand out with collectors and those are covered below. Using the exact same design as his Rated Rookie base card in 2017 Donruss Optic, the hard-signed autograph version is very popular. The low-numbered parallels sell into the thousands. 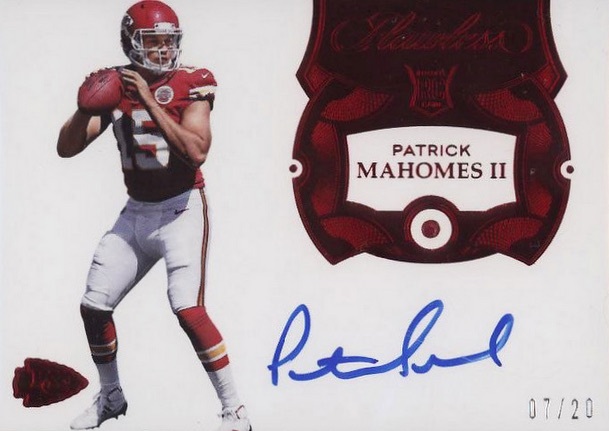 When you break it down, not much can touch the Patrick Mahomes Rookie Ticket autograph in 2017 Contenders NFL. 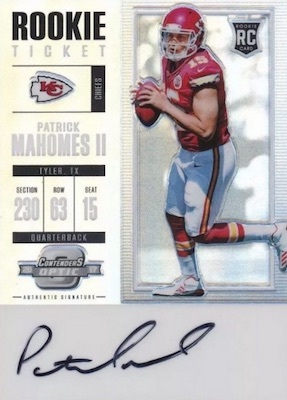 Although not numbered, Panini revealed that the on-card autograph for Mahomes is limited to 250 copies or less. His horizontal image variation checks in at 100 or less. 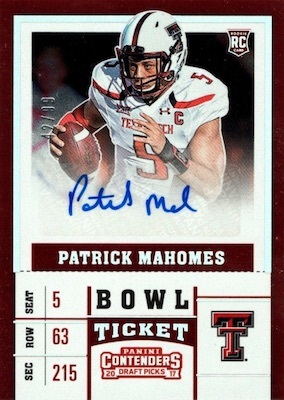 Issued in the collegiate 2017 Contenders Draft Picks before the 2017 NFL Draft took place, the College Ticket autograph shows Mahomes during his Texas Tech days. 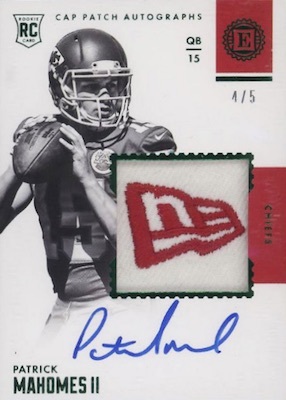 The sticker autograph is disappointing but the NCAA release still sees strong interest and it is cheaper than the NFL versions. You might be sensing a pattern here, but Contenders is a big seller with football collectors. The debut 2017 Contenders Optic takes the best part of Contenders—the on-card autograph—and adds Optichrome technology. Mahomes is a short print again, limited to 300 copies or less. 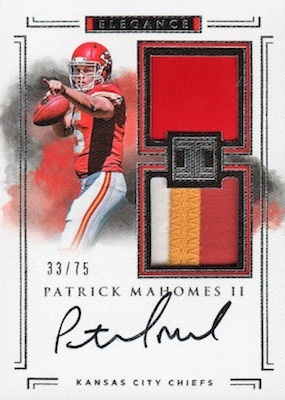 At just 25 copies, the SSP offering in 2017 Encased is easily one of the most elusive Patrick Mahomes rookie cards. The Cap Patch Autographs subset displays an on-card autograph and hat swatch. 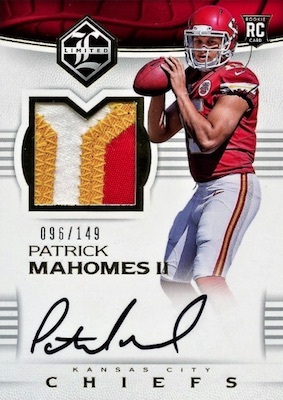 When talking about the ultra-premium 2017 Flawless, any Patrick Mahomes card in the set is a "big" card. Sure, the main Rookie Gems Signatures card has a jewel paired with the on-card signature, but all his autograph cards are hard-signed, and there are several. The RPA card is arguably more impressive and limited to just 25 copies. 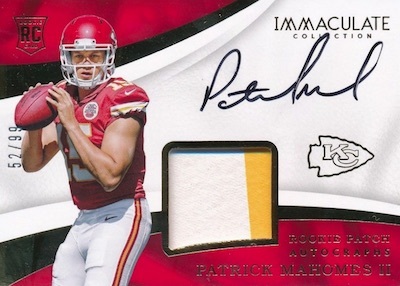 When dissecting the many high-end Patrick Mahomes rookies cards, 2017 Impeccable stands out. The Elegance subset design seems just a bit nicer, the signing space is not as cramped as others, and the helmet relic piece is much less common. However, with just 75 copies, the price is already quite high, so this is hardly a steal. One of the better values on the list (if such a thing exists), the 2017 Limited card boasts all the high-end attributes at a much lower cost. Hard-signed with a small swatch, the only thing keeping it lower on the radar is the slightly higher print run and weaker brand relevance. 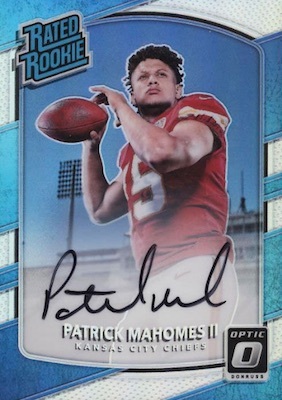 If you only care about hard-signed Patrick Mahomes cards, 2017 Origins is worth a shot. The base RPA has a sticker but most are done on-card. The one big tradeoff for these is the "00" jersey instead of his familiar #15, which limits prices to an extent. Choices include book cards and a few different ink colors. Although on-card would be better, the brand power of 2017 Prizm, plus many parallels, pushes this autograph much higher with collectors. 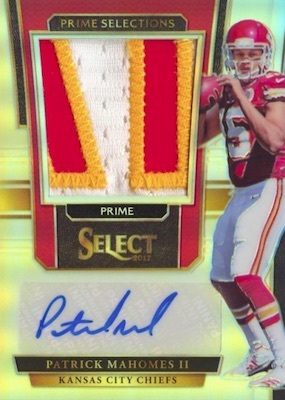 Likewise, 2017 Select, which has several Patrick Mahomes rookie autographs, is popular despite the sticker signatures throughout. Again, the low-numbered parallels see the most interest. Those who want National Treasures-level quality but can't stomach the NT cost have 2017 Immaculate Collection. No, it is not cheap, but the rarity is the same, the attributes are the same, and they also look pretty similar. The difference, of course, is the price, and whether you can spend hundreds or thousands. Saving the best for last, NT reigns supreme despite the glut of similar high-end sets that have sprung up. The 2017 National Treasures RPA for Mahomes sets the pace with high-grades (PSA 10) selling for over $10,000. 🔥2017 Panini PATRICK MAHOMES ROOKIE STALLIONS RC #RS-PM SP 39 499 PSA BGS 10? TRUE 1 1 RC PATRICK MAHOMES II 2017 Panini Immaculate *ONE OF ONE YELLOW ROOKIE! I think you left this one out. It’s pretty impressive and upon checking, it is the only 10 graded by PSA. Might want to revise the article and edit this one in there.